This is the most advanced ozone system for prepared water disinfection currently on the market. The Bright Blue CCS systems were designed and developed specifically for the bottling of “Bon Aqua” brand water. It conforms to Coca Cola standards for Ozonation and electrical equipment. These systems are designed to meet Coca Cola specifications for the disinfection of prepared water, namely 4 minutes of ozone contact time at a level high enough to ensure ozone residual after bottling of around 0.5ppm. This is order to achieve a 5 Log reduction in microbiology. There are two main components consisting of a large contacting vessel for Product (Syrup) ozonation and a control panel. 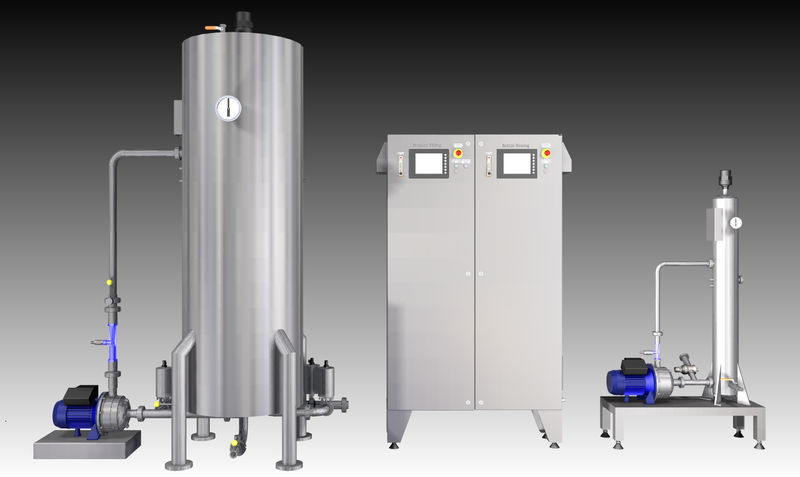 The large contacting vessel is sized to allow for an ozone/product contact time of 4 minutes at peak bottling flow. The ozone level in this tank is electronically controlled so as to give an ozone residual in the bottle after filling as required by the bottler. This is typically between 0.3 and 0.6 ppm. Continuous Ozone measurement is done using a Dr. Reiss GMBH ozone probe and measuring cell. This is coupled to a dedicated P.i.D controller which enables “Auto-tuning” of the ozone dosage. This allows for accurate control of the desired dissolved ozone level to within as little as 1% of the set-point. An optional Ethernet connection allows the entire system to be monitored & controlled from a Computer workstation. The Bright Blue system has been constantly improved and refined since the first unit was produced in 2001. The systems are extremely easy to operate. On a day to day basis the operator simply pushes the start/ stop button. The PLC does the rest. Only occasional interventions are required to calibrate the system against an ozone test kit. Maintenance is very straightforward with all major components being modular and easy to access. Wassertec hold a full spares inventory at all times. The built-in oxygen generator converts compressed air to oxygen at up to 95% purity. Unlike some other models, it is fully serviceable and can be easily & inexpensively re-sieved in the event of water ingress. Designed to produce high concentrations of ozone without the need for water cooling the ozone modules each have a max. output of 10gr/hr. Ozone output is regulated from 0-100% via a 4-20mA input signal from the PLC. Ozone cells have a 10,000 service interval. Power & Control The upper rail contains all the circuit breakers and switchgear for the system. The lower rail holds the PLC and PID controllers. Components are all Coca Cola approved. The top of the contacting systems feature a special ozone resistant de.gas valve. This allows undissolved ozone to be vented safely away from the production area whilst maintaining tank pressure. The ozone sampling probe and flow cell are fitted to the side of the contactor. Sample flow is controlled by a needle valve and rotameter built into the flow cell. This ensures accurate sampling and maximises the duty life of the replaceable probe membrane. Ozone & Oxygen sensors are mounted in the bottling hall and in the ozone plant room. They are interlocked to the PLC. In the event of ambient ozone levels exceeding the OHS limit the ozone system will be shut down and a warning displayed. The contacting systems are fitted with Guth Q-Fit sampling taps as per Coca Cola requirements. These can be flushed with a disinfecting solution after samples have been taken. • Ozone reacts extremely quickly, allowing the product to be disinfected in minutes. • Ozone reverts to Oxygen after use, leaving no chemical residual or taint. • Ozone is produced at the point of application from air & electricity, thus eliminating the need for handling and storage. • If the level of dissolved ozone is too high then there is a risk of oxidation of the product. • If the ozone level is too low then there will be insufficient oxidation. This will result in an increased risk of product infection. • An Ozone level between 0.4 and 0.6 ppm (parts per million) is ideal in most instances. Our ozone systems for bottling have always featured a high quality Rosemount Analytical ozone analyser to measure and control ozone electronically. Our original systems were only able to use an On/Off signal to control the ozone modules. (Some of our competitors still use this method). With this system the ozone would rise to the set-point. The ozone would switch off but the level would continue to rise. It would then peak and fall below the set-point as the ozone switched on again. And so on in a Yo-Yo pattern. In 2002 we improved our ozone power supplies to accept a 4-20mA control signal from the Rosemount ozone analyser. We were now able to control the ozone level to within the capability of the analyser. The Rosemount allows the user to input the level at which ozone output should be 100% and where output should be 0%. As the dissolved ozone level rises the power decreases and vise versa. This resulted in a much improved level of control. In 2008 we moved away from the Rosemount analyser to a fully PLC controlled system for which we developed our own control software. Measurements from the ozone probe are fed directly into the PLC where a dedicated P.I.D (proportional integral derivative) controller continuously measures the difference between the desired and actual levels of ozone, making adjustments all the time. As a result the user simply keys in the desired level of ozone and the controller targets and maintains the level to within 1%.